Meet the Designer! Elbeth Gillis 30th March. Renowned for sheer luxury and a sophistication that transcends time, the Elbeth Gillis brand is the hallmark of femininity. Stocked by boutiques around the world, Elbeth takes private appointments in Cape Town, South Africa. 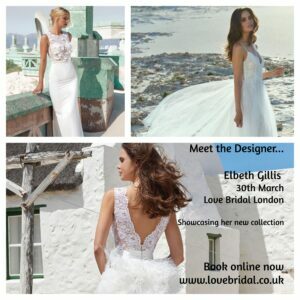 At the Elbeth Gillis Atelier, each gown is carefully handcrafted to ensure impeccable fit and quality. Your gown – the epitome of style, sophistication and uncompromising luxury.